Do your students know a direct object or object complement from a predicate nominative? Noun phrases populate diverse sentence structures that students must know for further development of grammar and writing skills. 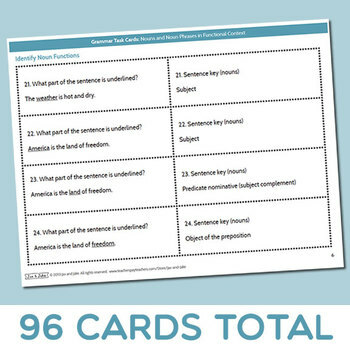 The total of 96 noun/noun phrase practice cards and answers are written from review to advanced levels to promote success for all students. The cards are intended for independent, whole group (document camera) or small group practice. This unit of nouns assists all students in achieving a common starting point in sentence analysis. Development of academic vocabulary is crucial in building competence in using phrases correctly and succinctly in writing. 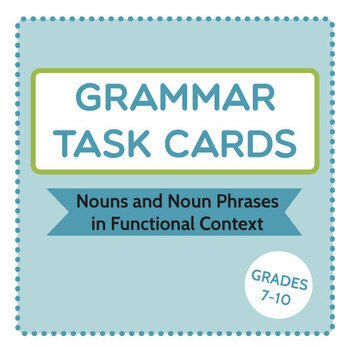 · 28 practice cards require that students identify noun phrase functions within sentences. · Answers are aligned with each card and may be used as a fold over for each page or for individual cards. A handout identifies nouns as a name for people, places, things, or ideas and defines nouns in sentence context as subjects, direct objects, indirect objects, object complements, predicate nominatives, and objects of prepositions. 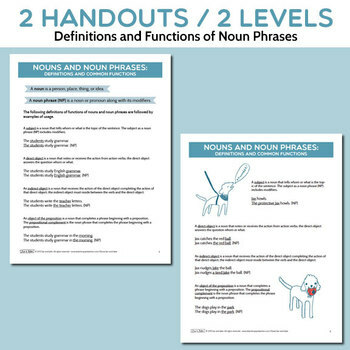 The handout also includes the definition and functions of noun phrases as subjects, direct objects, object complements, indirect objects, predicate nominatives, prepositional complements, determinatives, noun phrase modifiers, adverbials, or appositives. Example sentences illustrating each function are included. 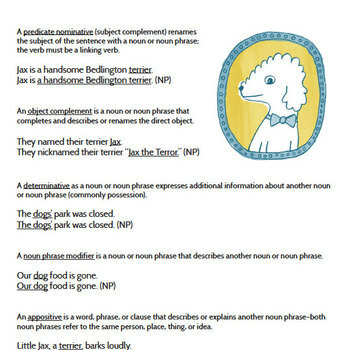 A second handout for younger students features illustrations to focus and engage and simple example sentences about a terrier and his daily adventures to clearly delineate the functions of nouns and noun phrases.